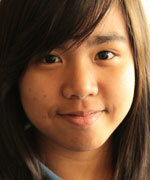 Nysa Acosta was born in Brunei and moved to the Philippines at the age of 4 with a passion in art and dancing. Ten years later, she moved to Pasadena and is now a sophomore at John Muir High School. She developed an interest in film and graphic design by being part of JMHS’s Arts, Entertainment, and Media Academy. Nysa decided to participate in GO PUBLIC because she considers this as an opportunity to learn more about film and to develop her skills. Another reason is because she thinks this is a moment to experience and see the world of PUSD.